Thousands of tonnes of toxic chromium could be poisoning residents of the southwestern Chinese province of Yunnan, but despite criticism the contaminated soil remains untreated. The pollution was first exposed after the arrest of two drivers hired by the Luliang Peace Chemical in Yunnan's Luliang County, a major producer of chromium salts. The drivers were illegally dumping up to 5000 tonnes of chromium slag in nearby villages. Chromium salts are widely used in metallurgy, tanning and paint and dye making, but their manufacture results in large amounts of slag which, if not processed, can form carcinogenic hexavalent chromium. On 12 August an investigation by Yunnan Info Daily found that Luliang Peace Chemical dumped up to 140,000 tonnes of unprocessed slag. The slag is piled along the bank of the river Nanpanjiang, the source of the river Zhujiang that provides the drinking water to the wealthy Guangdong Province. There have also been reports that Xinglong, a village near Luliang Peace Chemical, has had much higher rates of cancer since the plant began operating. However, local government in Luliang County and Chuxiong City, to which Luliang is affiliated, denies that the Zhujiang is polluted or that there are significantly more incidences of cancer in Xinglong than in other villages. As of 24 August, the only legal action has been against the two drivers, although local government has asked Luliang Peace Chemical to quickly process and relocate the slag. In recent years, dozens of heavy metal pollution cases have been uncovered in China, including up to 10 cases of chromium contamination. In a study published in 2008, Chinese scientists from Liaoning Medical University found that residents living in a district polluted by chromium had a cancer rate three times higher than a control group. 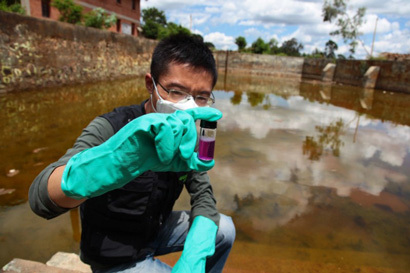 Yu Ping, who studies the processing of chromium pollutants at Wuhan University, China, says that sudden chromium pollution of water is relatively easy to fix, but there has been no comprehensive evaluation of contaminated soil, which could become a long-lasting problem in Yunnan. 'We do not know when it will be released [from the soil] to the water or how long it will last in the soil,' she says.